SPOILER ALERT. This review will discuss plot points of this film — and the novel it is based on — that you may not want to know if you haven’t already seen the film and read the novel. 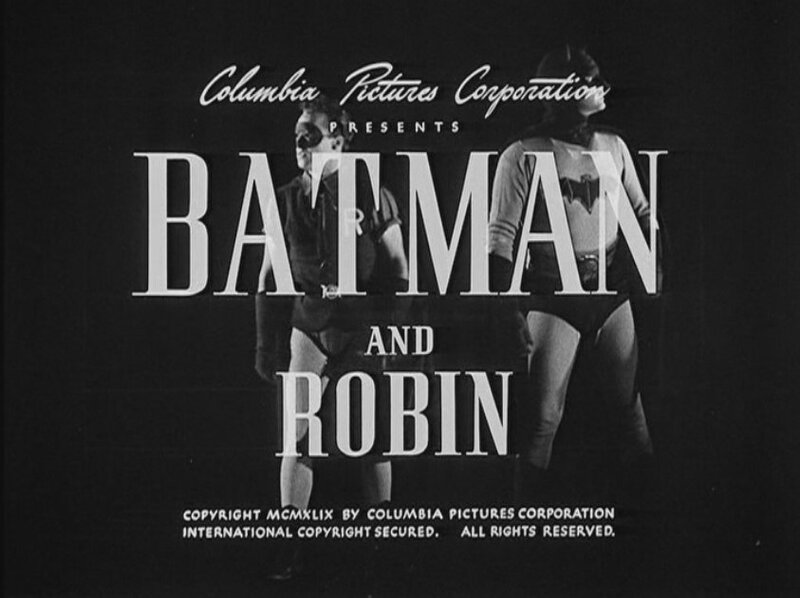 This might come as a surprise to people used to films that slavishly adhere to the smallest details of the novels and comic books they’re adapted from (lest the filmmakers incur the wrath of throngs of nerds on the internet), but movies based on books used to be wildly different from their source material. The phrase “the book was better” became a cliché for a lot of reasons, but one reason is that during the era of the Hays Code, novels could be much more explicit about sexuality, violence, race, gender, and other “grown-up” issues than Hollywood films could be. 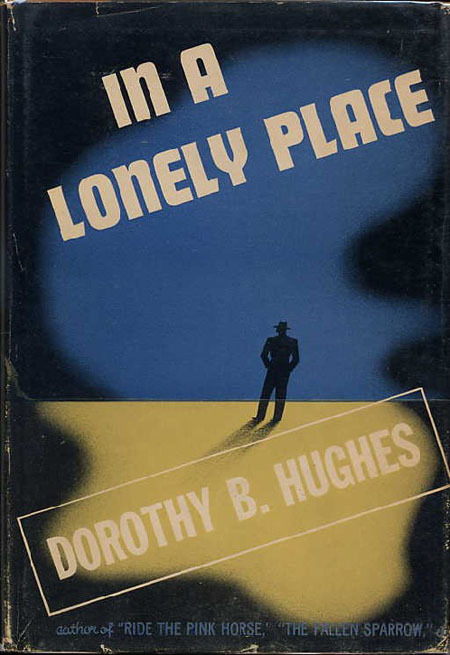 There was probably no way Dorothy B. Hughes’s 1947 novel In a Lonely Place — which is about a man who stalks, rapes, and murders a series of women in postwar Los Angeles — was ever going to make it to the screen with its original plot intact. 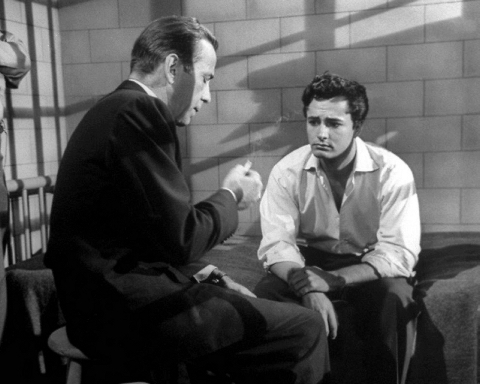 What’s interesting about Nicholas Ray’s film adaptation, however, is that it fundamentally changes the story while retaining the novel’s exploration of toxic masculinity. Hughes’s novel is a third-person narrative that never leaves the perspective of Dixon Steele, a World War II veteran who is pretending to write a novel while receiving financial support from a rich uncle. Dixon — “Dix” to his friends — sponges off a wealthy friend from college, Mel Terriss, who never appears in the novel and is supposedly out of the country. Dix lives in Mel’s apartment, wears his clothes, and charges purchases to his expense account. One of Dix’s friends from his days in the service, Brub Nicolai, is now an LAPD detective investigating the murders that Dix is committing. Under the guise of “research,” Dix insinuates himself into Brub’s life and into Brub’s investigation. Dix was a pilot in the war, and he became addicted to the thrill of danger when flying missions. When he rides along with the police and returns to the scenes of his crimes, he learns what they know and what they don’t know, and he experiences rushes of adrenaline by pushing his luck. 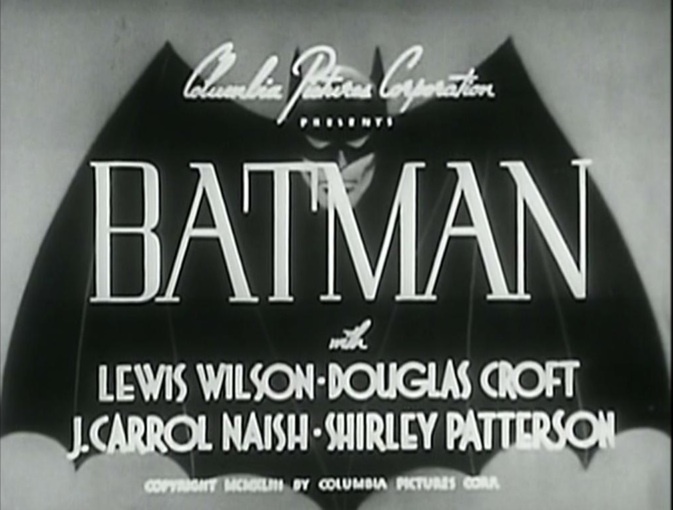 Andrew Solt’s screenplay, from an adaptation by Edmund H. North, retains most of the characters’ original names, but nearly everything else is different in some way. 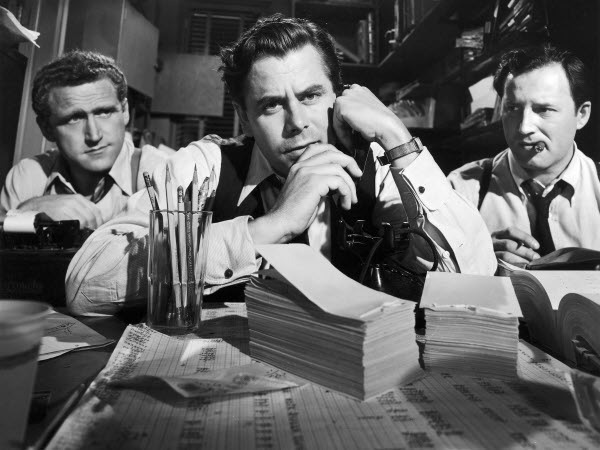 Instead of pretending to write a mystery novel as a cover, in the film version Dixon Steele is a successful screenwriter; or at least he used to be. Instead of being outwardly “normal” and utterly average-looking, the film’s Dix is distinctive-looking, well-known around Los Angeles, and has a police record for violence. Instead of a string of murders, Dixon is suspected of only one; the murder of a checkroom girl he took home one night to help him with a screenplay. If the producers had been casting for a straight adaptation of the book, I think the perfect choice for Dixon Steele would have been Robert Montgomery, who starred in another adaptation of a novel by Dorothy B. Hughes, Ride the Pink Horse (1947). 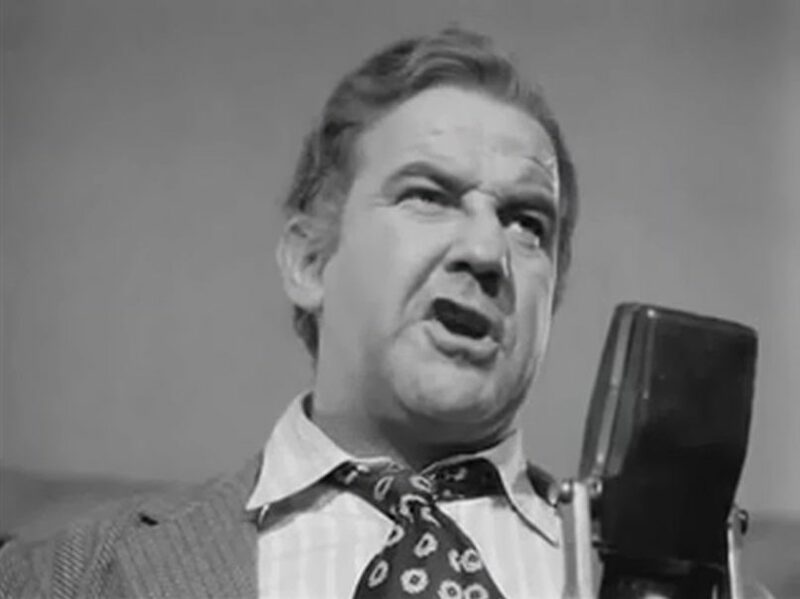 Montgomery was the kind of guy who would be hard to pick out of a police line-up, but he had intense and haunted eyes. He also served in combat in World War II, just like Dixon Steele. Bogart, on the other hand, is always “Bogie” no matter who he is playing. I don’t mean that he was ever typecast, just that his unique image and his star power were always bigger than the character, at least in the post-Casablanca era. This works for the film version of In a Lonely Place, since Dix is recognized all over Hollywood, mostly by people who dislike him. 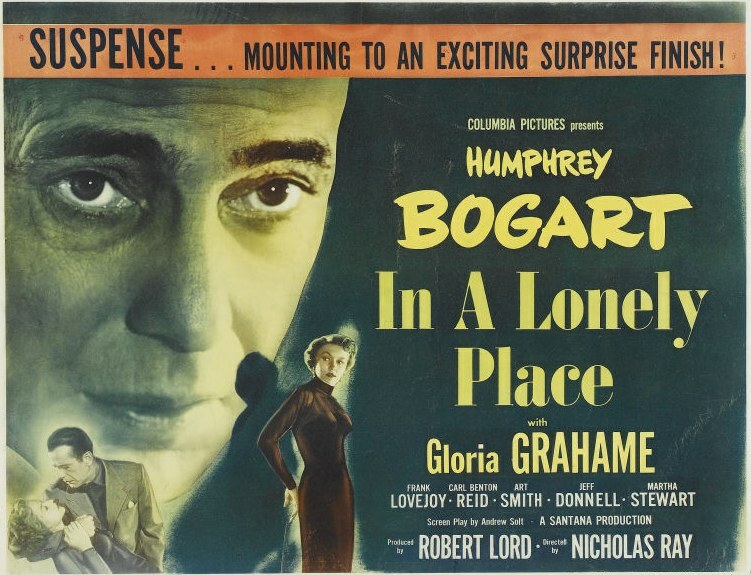 In a Lonely Place is a masterful film from Nicholas Ray, a director who had already made a handful of impressive films in a relatively short career. The changes made to Hughes’s novel all work in the context of the film, since it’s not a film about a murderer, it’s a film about an angry and deeply unhappy man who is unable to control his rage. Solt’s screenplay originally ended with Dixon — who is innocent of the murder he’s suspected of — strangling his girlfriend, Laurel Gray (Gloria Grahame). This is a trite conclusion that implies that police railroading “made him do it,” and it’s good that Ray shot a different ending. What we’re left with is something much more profound. Unlike most Hollywood films, the love of a good woman doesn’t reform Dixon Steele. His rage and his refusal to confront his own propensity for violence drives her away. He is unwilling to confront his own demons, and it damns him to a lifetime alone. Posted in 1950, May 1950 and tagged Columbia Pictures, Dorothy B. Hughes, Film Noir, Frank Lovejoy, Gloria Grahame, Humphrey Bogart, Nicholas Ray. Bookmark the permalink. The Undercover Man is a tightly paced, hard-driving procedural that grabbed me from the first few minutes and never let go. It’s a fictionalized version of the federal case against Al Capone in which Capone not only never appears onscreen, his name is never spoken aloud. He’s referred to simply as “The Big Fellow,” even in newspaper headlines. Director Joseph H. Lewis’s two most enduring films — Gun Crazy (1950) and The Big Combo (1955) — lay ahead of him, but he’d been working in Hollywood for more than a decade and had directed more than two dozen pictures (mostly westerns) before he directed The Undercover Man. The only one I’ve seen is The Swordsman (1948). I never thought I’d enjoy a Technicolor swashbuckler starring Larry Parks that took place in the Scottish highlands, but I really enjoyed The Swordsman. Lewis made stylish films with great pacing. The Undercover Man has a standard story and stock characters, but it kept me involved because it’s paced really well. It’s loosely based on the career of Treasury agent Frank J. Wilson, who was involved with the 1931 prosecution of Al Capone and investigated the Lindbergh kidnapping. The film takes place in the present day, however, and isn’t specifically about Capone. 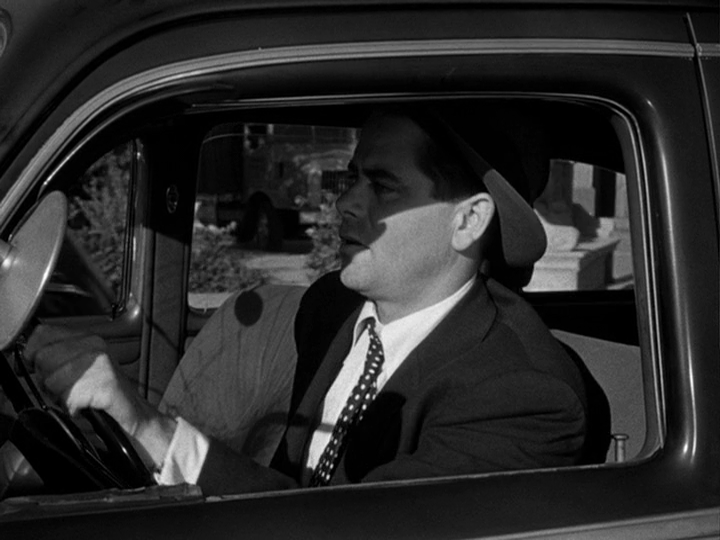 Glenn Ford plays a fictionalized version of Frank J. Wilson, named “Frank Warren.” The title of the film is misleading, since Warren doesn’t go undercover. 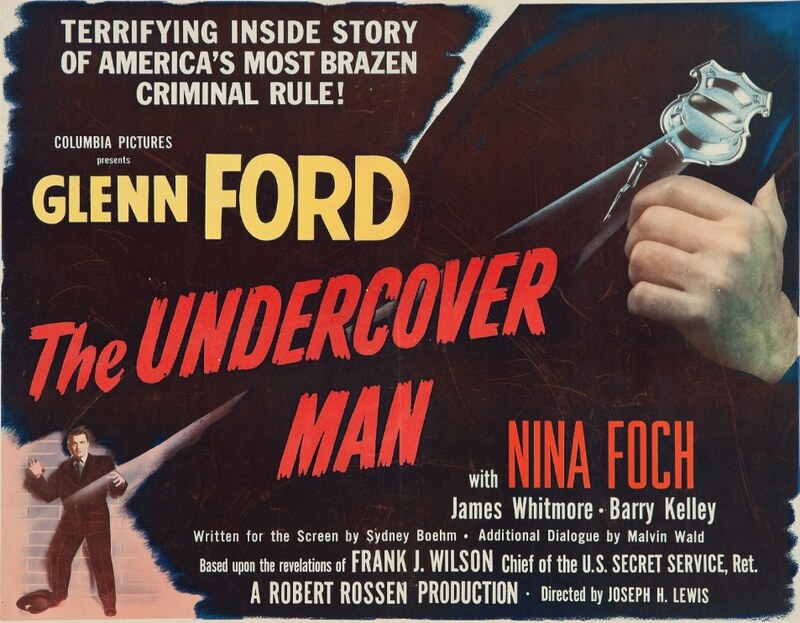 The only “undercover man” in the film is a contact of Warren’s who’s gunned down by mobsters in the early going. 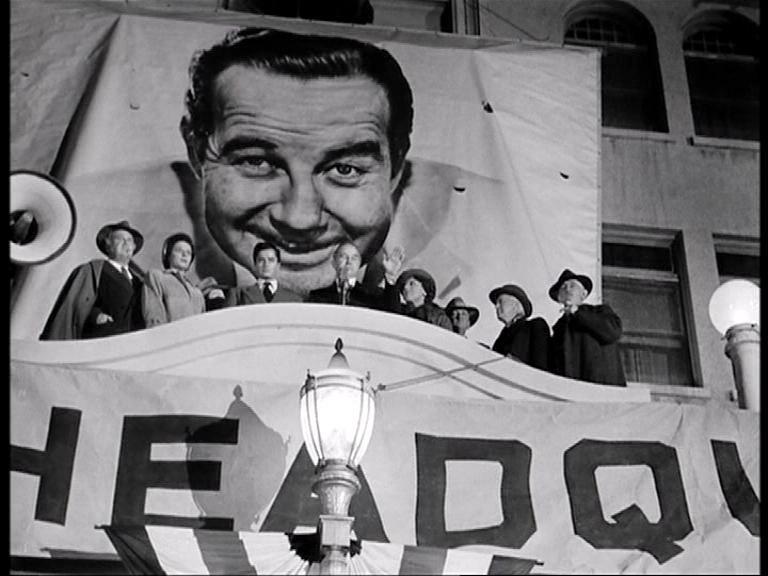 The film sticks to the tax evasion angle of the Capone case, and most of the drama involves Warren poring over financial records and butting heads with The Big Fellow’s crooked attorney, Edward O’Rourke (Barry Kelley). So if you’re looking for an accountant who picks up a shotgun and blasts mobsters by the dozen, like Charles Martin Smith does in Brian De Palma’s The Untouchables (1987), then you might find The Undercover Man pretty boring. But if you’re looking for a hard-nosed flick about cops and criminals made in a semi-documentary style, you can’t go wrong with The Undercover Man. Posted in 1949, March 1949 and tagged Al Capone, Barry Kelley, Columbia Pictures, Film Noir, Glenn Ford, James Whitmore, Joseph H. Lewis, Nina Foch, Robert Rossen, The Untouchables. Bookmark the permalink. 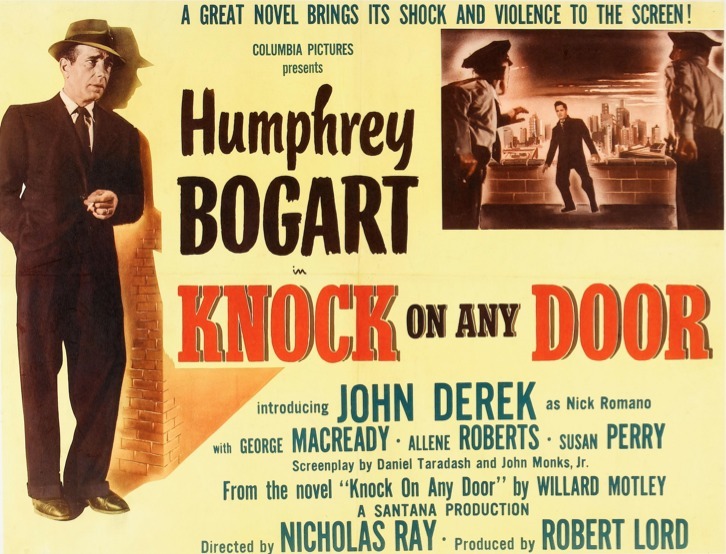 Knock on Any Door was the third film Nicholas Ray directed, but it was the first of his films to have a wide theatrical release. 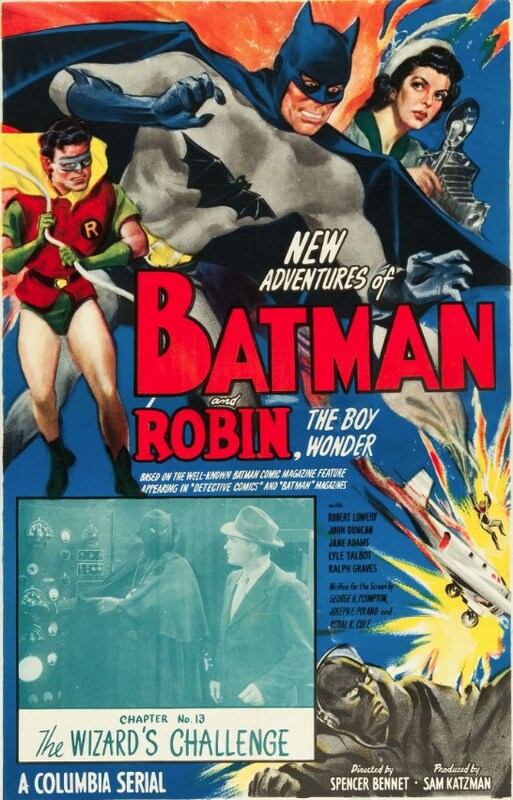 Ray directed his first film, They Live by Night, in 1947, but RKO didn’t know how to market it, and it premiered in the United Kingdom in a single theater on August 5, 1948. They didn’t know how to market his second film, either — A Woman’s Secret — which he directed in 1948. However, They Live by Night had been screened privately for many actors and producers in Hollywood. 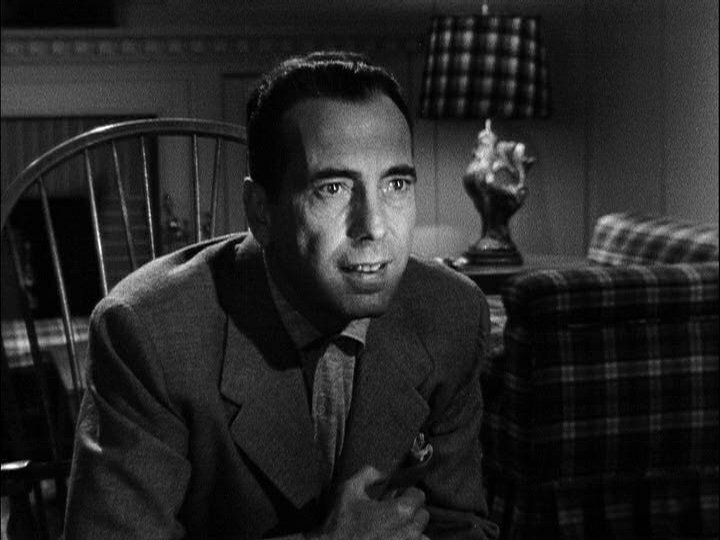 Humphrey Bogart was impressed by it, and he enlisted Ray to direct Knock on Any Door, the first film made by Bogart’s independent production company, Santana Pictures. 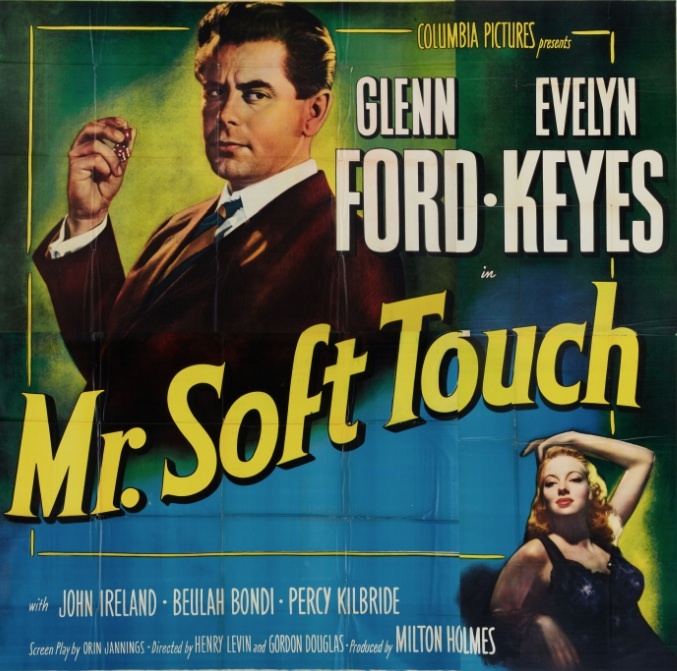 Knock on Any Door was an enormous success, and Ray’s earlier films soon found their way into theaters; A Woman’s Secret in March 1949, and They Live by Night in November 1949. The screenplay for Knock on Any Door, by Daniel Taradash and John Monks Jr., was based on the best-selling 1947 novel by Willard Motley, an African-American writer from Chicago. Motley’s novel is the story of a young Italian-American named Nick Romano who went from being an altar boy to a career criminal after growing up in a crime-ridden neighborhood and being cycled through the juvenile justice system. Much is made of Derek’s good looks. When he’s put on trial for murdering a police officer, his lawyer, Andrew Morton (Humphrey Bogart), makes sure to get as many women on the jury as he can. Morton feels responsible for the man Romano has become, since his lackadaisical legal work for the Romano family when Nick was a young man doomed Nick’s father to prison. He wants to stack the jury with as many women as possible, since he believes they’ll be swayed by his cherubic face. Morton’s argument in court is that while Nick Romano has a criminal past, he is innocent of the crime of murder. And because Morton feels partially responsible for Nick’s criminal career, he fights for him with everything he’s got. 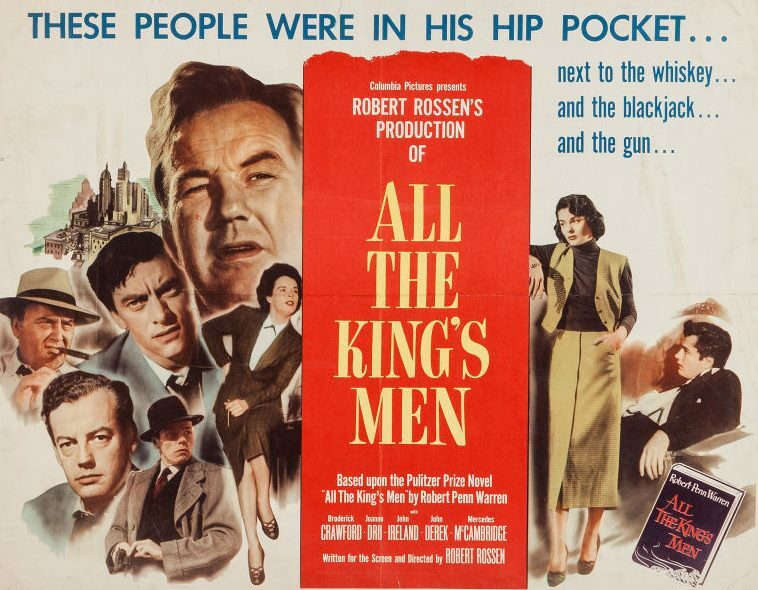 Knock on Any Door superficially resembles Call Northside 777 (1948), another movie set in Chicago about a man on a crusade to prove that a second-generation American accused of murdering a police officer has been railroaded. But there’s a major difference between Knock on Any Door and Call Northside 777, and it’s why I put a spoiler alert at the beginning of this review. “Pretty Boy” Nick Romano is guilty. I don’t know if this is obvious to some viewers. It wasn’t obvious to me. In fact, I felt so completely hoodwinked by Knock on Any Door that I couldn’t stop thinking about its climax after I watched it. 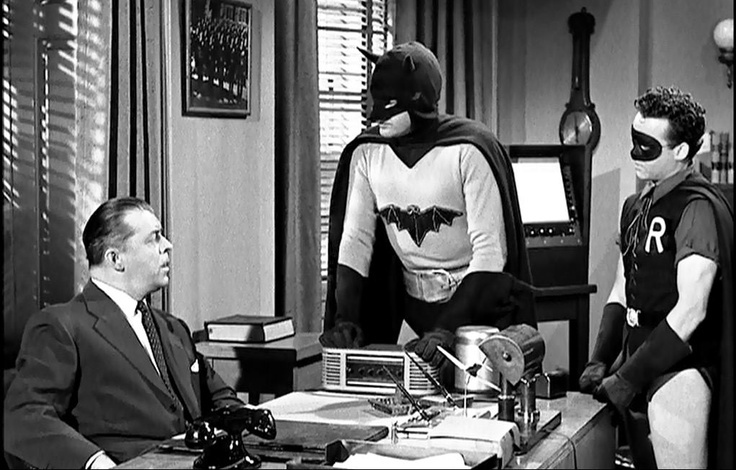 Humphrey Bogart is such a likable protagonist, and his adversary — District Attorney Kerman (George Macready) — is so unlikable that I never once stopped to consider that Romano might actually be guilty. 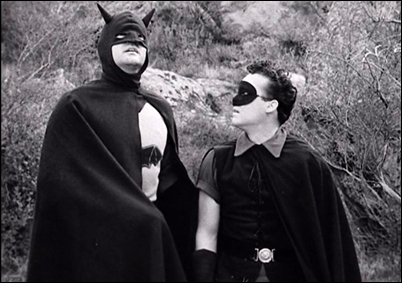 The film even sets up Romano as a handsome foil for the D.A., whose face is scarred. It’s strongly implied during all of the cross-examination scenes that Kerman is jealous of the young man’s good looks. But then the film pulls the rug out from under the viewer. Not only does Romano finally break down on the stand and admit his guilt, but the last shot of the film is of Romano with the back of his head shaved, walking down a long corridor to the electric chair. I couldn’t believe it. 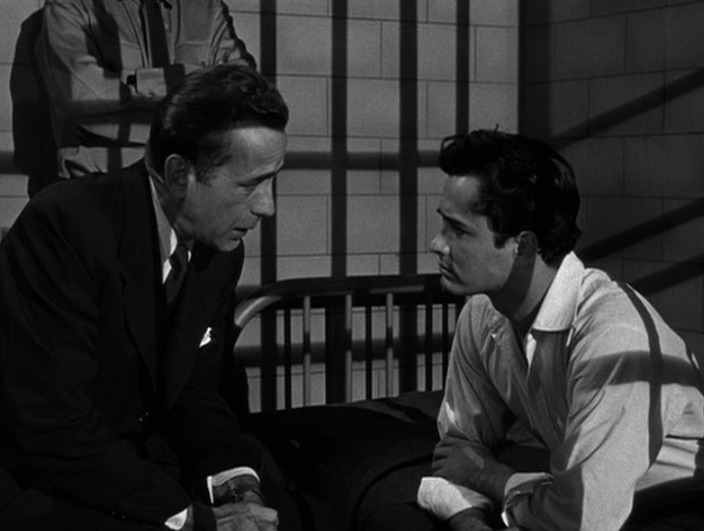 After Romano’s confession and before his walk to the death chamber, Bogart has a chance to speechify as only Bogart could. It’s a well-delivered speech about how crime is everyone’s fault when it’s grown in the Petri dish of the slums, but in the decades since Knock on Any Door was made, “Don’t blame me, blame society” has become a cliché. The shouted message of the film didn’t have the same impact as the simple fact that I had grown to like Romano and was looking forward to seeing him found not guilty. When the film ended I felt betrayed and devastated. Posted in 1949, February 1949 and tagged Allene Roberts, Chicago, Columbia Pictures, Film Noir, George Macready, Humphrey Bogart, John Derek, Juvenile Delinquency, Nicholas Ray, Santana Pictures, Willard Motley. Bookmark the permalink.